Any time a new automotive category emerges, I’m immediately fascinated. That’s why I’m methodically exploring the subcompact SUV (entry-level SUV?) market. Here’s another test drive in the segment: the 2016 Honda HR-V EX-L Navi. SUV styling in smaller proportions gives buyers the sense that they can tackle any road conditions without the gas pump tackling their wallets. Im my limited time with the practical and understated HR-V, I concluded that looks are not deceiving. Where do you place this vehicle in Honda’s lineup? You get more room than the Fit offers, with the same all-wheel-drive ability of the CR-V. You could look at it as the Honda Fit’s bigger sibling or the Honda CR-V’s little brother. Maybe the Fit is the better comparison, since the HR-V and the Fit are (assembly) “line mates” at Honda’s Celaya, Mexico auto plant. Honda manages a coupe-like look thanks to side panel detailing and rear door handles embedded behind the rear door windows. You have to look twice to see those handles. I couldn’t avoid the conclusion that this vehicle is undoubtedly for the practical-minded. My first clue: black plastic lining the bottom edges of the vehicle all round will help to preserve the body against Canadian winter road salt. The utilitarian theme continues inside the HR-V. You do get nice touches like heated front seats, Honda’s Display Audio System and a subtly attractive overall look. The EX-L Navi acquires leather on the seats, steering wheel and shift knob. 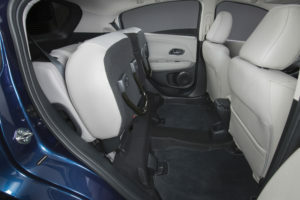 But Honda avoids certain frills in the HR-V. For instance, the front seats and steering wheel feature manual adjustments. Rear seats offer decent legroom but the downward-sloping roof, while stylish from the outside, limits headroom for taller passengers. The bag entered the hatch under the flexible fabric privacy cover. 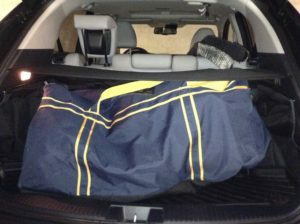 Two hockey bags could be stacked back there, or at least one rear seat would have to fold down. 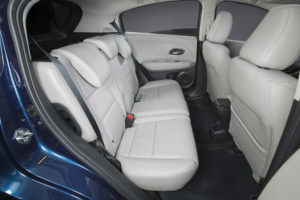 Empty space under Honda’s Magic Seat rear seats (accomplished thanks to a centre-mounted fuel tank) lets the seats sink right to the floor when you do fold them down, resulting in impressive amounts of cargo room when you turn the HR-V into a two-seater cargo hauler. Aside from three small buttons, the HR-V’s centre stack is a study in piano black screens. Start the vehicle and touch controls light up for the 7-inch touchscreen Display Audio screen and climate controls just ahead of the shift lever. USB inputs and other ports are hidden under the centre console, again ahead of the shift lever. 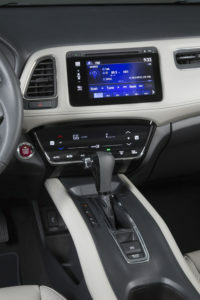 This helps conceal any devices left in the HR-V but these inputs require mild amounts of bending and contortion to reach. A larger centre cubby that also contains outlets would charge devices and keep them hidden much better. This little cluster also includes an HDMI port and a 12-volt power outlet. Other power outlets are available in the second row and the hatch. The base 160-watt, 4-speaker AM/FM/CD with MP3/Windows Media® Audio playback capability gets upgraded to 180 watts and 6 speakers in EX trim. All the requisite digital features are here, but accessing them is not much fun. I can get used to touch controls for things like volume, tuning the radio and climate controls. Maybe this is what Honda thinks the market wants. And there’s no denying the automaker achieved a look here. That said, using these touch controls will never be as easy as would dials and levers. The instrument cluster is straightforward. It consists of a three-circle setup, with the one on the right being a screen showing fuel level, real-time fuel consumption, time and other information. Honda’s ECO Assist™ feature causes the speedometer illumination to change from white to green depending on current fuel efficiency. The HR-V drives as one would expect an economy car to drive. 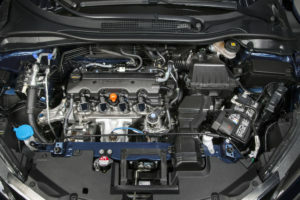 The one engine choice in this vehicle, a 1.8-litre 4-cylinder 16-valve SOHC i-VTEC® engine, produces a peak 141 horsepower and 127 lb.-ft. of torque. These numbers aren’t staggering but you can coax quick starts out of this engine when you need to while keeping speedometer illumination green most of the time, depending on your driving style. Handling is smooth, although taking turns quickly results in noticeable (but not exaggerated) body roll. 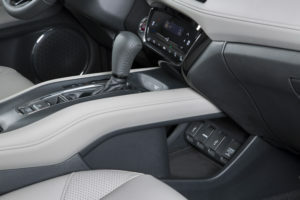 Continuously variable transmissions dominate the trim levels. My EX tester also features paddle shifters so drivers can choose artificially programmed (made-up) “gears” in the CVT. Using Lanewatch meant keeping my eyes moving faster than they ordinarily do when I changed lanes. (I didn’t find myself looking at it during right turns.) I like the idea of Lanewatch, but I won’t say it’s indispensable. Other active safety features on the EX-L Navi include forward collision warning and lane departure warning. Published EX-L Navi ratings are 8.8 L/100km in the city, 7.2 on the highway and 8.1 combined. 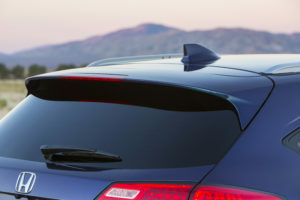 Other trim levels boast similar numbers. My EX-L Navi tester retails for $29,990 MSRP. The base level LX (which, along with the base EX, are the only models to offer a 6-speed manual transmission) starts at $20,690 MSRP. Honda has built a reputation for reliable vehicles that, while not always the sportiest to drive, will endure as long as owners choose to keep them. The source of this claim? I still drive a 1998 Honda Civic EX, and when I look around on the road, I realize I’m not the only one. The strongest information I got from the HR-V didn’t come from press releases or spec sheets. 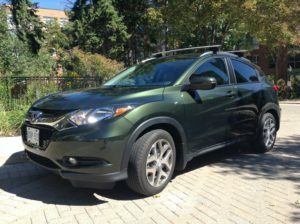 The HR-V elicits the feeling I had when I drove my car off the lot almost two decades ago, even though Honda has adapted with the times. Like it does for my own car, my gut tells me the HR-V is a little boring. It’s for getting places reliably. It’s for fitting in most parking spots. It isn’t flashy. It’s a commoner’s vehicle. And as counterintuitive as this may sound, that familiar feeling makes me suggest buyers looking for a subcompact SUV check out the HR-V. My gut tells me it won’t let them down.